More info:- Price depends on ship, cabin choice (on/below deck) and date - Plus 40 Euros port fees payable on board - No minimum age. Children under 10 pay 50% - Vessels choice of 'Comfort' or 'Premium' (newer and larger) All vessels have en-suite and air con. One of the finest ways to take in Southern Croatia, its coves, islands and culturally rich cities, is on board a small cruise boat, travelling in comfort and style but with only 40 passengers on board. This Southern Croatia cruise begins and ends in the ancient harbour of Split, with plenty of time built into your itinerary to explore the city’s magnificent UNESCO World Heritage Site. The centre of this is the Roman built Diocletian's Palace with a maze of other ancient archaeological wonders all around it. From Split we set sail to discover the islands of Southern Croatia and this stunning Dalmatian coast. Such as Korcula, famous for being the island where Marco Polo was born. And, with its ancient, fortified centre, is sometimes called a mini Dubrovnik. Or Hvar which, as well as being famous for sailing chic, is also home to some stunning ancient fishing towns, remote and idyllic bays for swimming in and lavender fields. And Mljet Island, a stunning mixture of pine wooded hills, sandy beaches and also two salt water lakes in the interior. All protected by the Mljet National Park. On all of these islands, and more, we stop to take in some wonderful local experiences, many of which include food and wine, as Croatia is brimming with local produce and also many local tavernas hugging the waterfront. Wine tastings at various island vineyards is one of our favourite things to do on our trips. As is our stop off in Dubrovnik, surely the most magnificent medieval city on the Mediterranean. 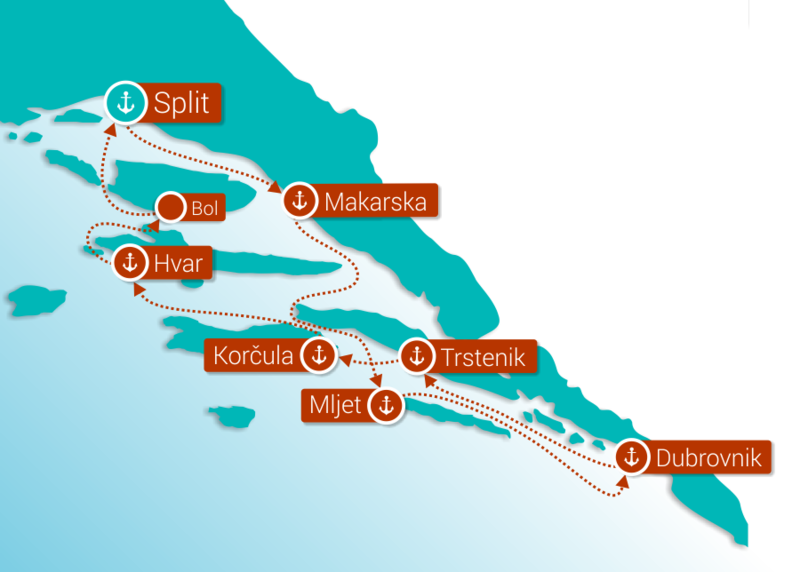 For these Croatia cruises, we use a variety of small vessels, all with comfortable, ensuite and spacious accommodation as well as excellent deck facilities. Sleeping maximum 40 passengers so you will never feel overcrowded. We love having families on board and children under ten will be given a 50 per cent discount, although we do advise checking to see what family accommodation is available. You will also have plenty of family time, with only one dinner on board, and the rest of evening meals are on shore, exploring local restaurants and tavernas. Breakfasts, lunches and one dinner are included in the price of the holiday. Solo travellers are also most welcome, sharing a cabin with another solo traveller of the same gender, or for a solo supplement of 50% for their own cabin. The management of these vessels is dedicated to sustainable tourism in Croatia and are passionate about raising awareness of environmental, economic and sustainable tourism policies in Croatia. They believe the promotion of environmental awareness in the region will have a prolonged and positive impact on the livelihoods of the local people and maintain Croatia as a sustainable tourism destination for future generations. Our visits to Mljet National Park & The Benedictine monastery on St Mary Isle will help preserve them by putting a little funding directly into their coffers. The vessels that we use are all built in Croatia, specifically for use in these waters. This ensures that the most appropriate local resources are used wherever possible, and that the vessels are all built to comply and exceed local environmental and sustainability regulations. By using small ships to visit and stay in some of the smaller ports and villages, we are providing an opportunity for a boost to tourism without the need for potentially unwanted and inappropriate new hotels to be built, and without increasing road traffic. Vast floating blocks of flats, otherwise known as cruise ships, arrive direct from Venice and spill their loads onto the Dubrovnik dock where they are met by a huge fleet of buses that whisk them for a couple of hours in the beautiful city. These monoliths cruise past one of Europe's most beautiful coastlines with barely a second glance, and without a thought to the places they are missing. Our vessel, on the other hand, stops at many small ports and towns where we can fully enjoy some of the very best that Croatia has to offer. The money that we will spend in many of these smaller communities will help to preserve the fantastic heritage of these antique coastline. Our visits to Mljet National Park & The Benedictine monastery on St Mary Isle will help preserve them by putting a little funding directly into their coffers. By leaving our guests free to choose their own dining venues in the evenings, this ensures that a range of small restaurants and cafes will benefit from our guests spending. Our vessels are captained and crewed by Croatians, and most of the produce served on board in sourced locally, sometimes from the crew’s family members.